The story of Yedus Anglarond is a glorious and tragic one. He was born in the year 8112 F.R. to Lord Corneus and Lady Amada Anglarond. The Anglarond family had been stripped of most of its lands hundreds of years ago, shortly after the Dark Conquest, and they managed to retain only one outlying manor house. Heavily taxed, the family was kept poor for centuries. When Yedus was born, the family was destitute, but the Anglaronds had retained their pride, and each patriarch had taught his offspring of his heritage and lineage. Thus Lord Corneus instilled in the young Lordling Yedus pride in nobility and family. Poor because of the policies of the Lords of Sin, the family had also long ago sworn a secret vow of eternal hatred against the Dark Forces. Thus Yedus grew up despising the Lord of Lust, and as soon as he was old enough, he began to take part in the revolutionary activities masterminded by the cunning and good Elmor Ack-Thenton, a rich local farmer and merchant. Although Yedus could hold his own with a weapon, Elmor recognized in Yedus a faculty that was far more useful and rare than the ability to wield a weapon: he sensed a mind that was supple and strong, a mind with an innate understanding of the workings of magic. 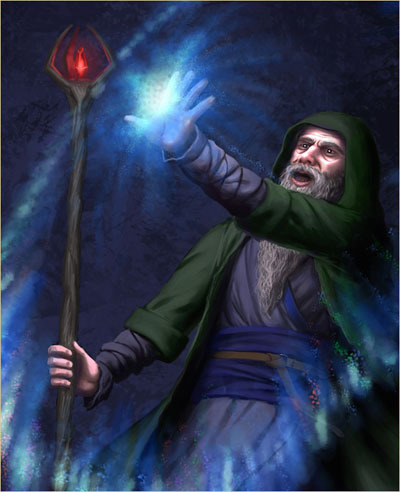 Elmor was in a unique position to recognize such a gift, for even though he himself was no mage, his wife Liliane had long studied the arcane arts, using them to aid the resistance, and thus he was able to see this ability in others. He turned Yedus over to Liliane, who trained him in the ways of magic, as well as encouraging him to gain knowledge of all kinds. Soon the wise woman found that Yedus' abilities far surpassed her own. Yedus used his new skill in spells to aid the resistance more than he ever had in the past. He found that with his skill in magic, besides power, came knowledge and foresight. He was able to advise and recommend things that helped the rebellion grow strong, and he was proud of this. Soon the leaders of the rebellion, Alan Hightower, Elmor, and Alberic came to rely on the young Yedus. When Yedus was introduced to the promising and charismatic young Naglor Osbern, ten years his junior, the two quickly became fast friends. Yedus lost his mentors during the botched rebel assault on the Spur Fortress in 8157, but this merely steeled his and Naglor's resolve to fight on. When Valanduil and Bartarius joined the resistance in 8160, Yedus' hopes were finally realized and the kingdom was freed. When Naglor was appointed Lord high Mayor, Yedus became High Mage. Later, when Naglor became king, Yedus became Court High Mage. In this position, Yedus founded the Battle Mage's College to train wizards to support the armies of the Spur. In 8170, something happened to Yedus that he had never anticipated: the Stone of Silence, a powerful artifact, fell into his hands. Although Valanduil argued it belonged to the Elves, Naglor decreed that it remain in the hands of Kelerak until the imminent threat of invasion from Afej and from the East was gone, and thus Yedus began to study the artifact. In perhaps the crescendo of the mage's life, when Afej did attack the city, Yedus was able to use the incredible magics of the artifact to provide victory for the forces of good. However, like other possessors of the Stone before him, Yedus began to become more and more obsessed with the artifact. Initially only desiring to possess it to protect his people, the mage eventually came to desire the artifact for itself. Seeing in his former friends a desire to possess the Stone, Yedus withdrew from the Mage's College and from his life in the city and became a hermit, desiring only to be with the Stone. His once excellent and able mind had been overthrown. When the Lords of the West and Naglor worked out a treaty in 8172 to return the Stone to the Elves in return for an alliance, Yedus was pushed to his breaking point. Confronted by the Lords of the West, Yedus used his powerful magics to flee the city with the Stone. Pursued doggedly by the Lords of the West, the mage fled south towards Orland, desiring to turn West into Daven and eventually travel to Elder Daven City where he would be beyond the reach of King Naglor. Before he could do this, however, he was ambushed by a powerful force of the Lord of Envy's border guards, led by Envy's Chamberlain, the terrible Mind Flayer Koorlsh. Although the mage fought valiantly, he was taken by surprise, and, unable to bring the Stone to bear, he fell to the forces of evil. Thus a once noble man who had done much good in his life met an ignoble and lonely end. See Invisibility. Yedus can see invisible creatures and objects within 10 feet of him that are within his line of sight. Foresight. Yedus begins each day by rolling three d20s and recording the numbers rolled. He can replace any attack roll, saving throw, or ability check made by him or a creature that he can see with one of these foresight rolls. He must choose to do so before the roll, and he can replace a roll in this way only once per turn. When he finishes a long rest, he loses any unused foresight rolls. *Yedus casts these spells on himself before combat. Staff of Frost: Melee Attack: +5 to hit, reach 5 ft., one creature. Hit: 9 (1d6+2) bludgeoning damage.